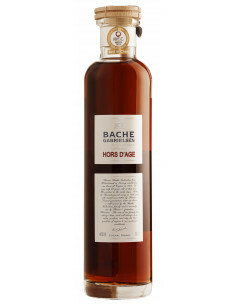 When it comes to innovative products from Cognac, the house of Bache-Gabrielsen certainly has to be up there with the best. And they’ve now partnered with Audemus Spirits to create what is truly a Scandinavian product, an Aquavit. The first batch only sees 2500 bottles. 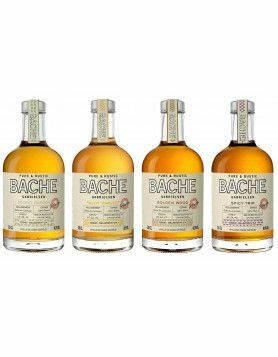 Bache Gabrielsen hit the headlines in 2017 when they created their American Oak Whisky back in 2017. 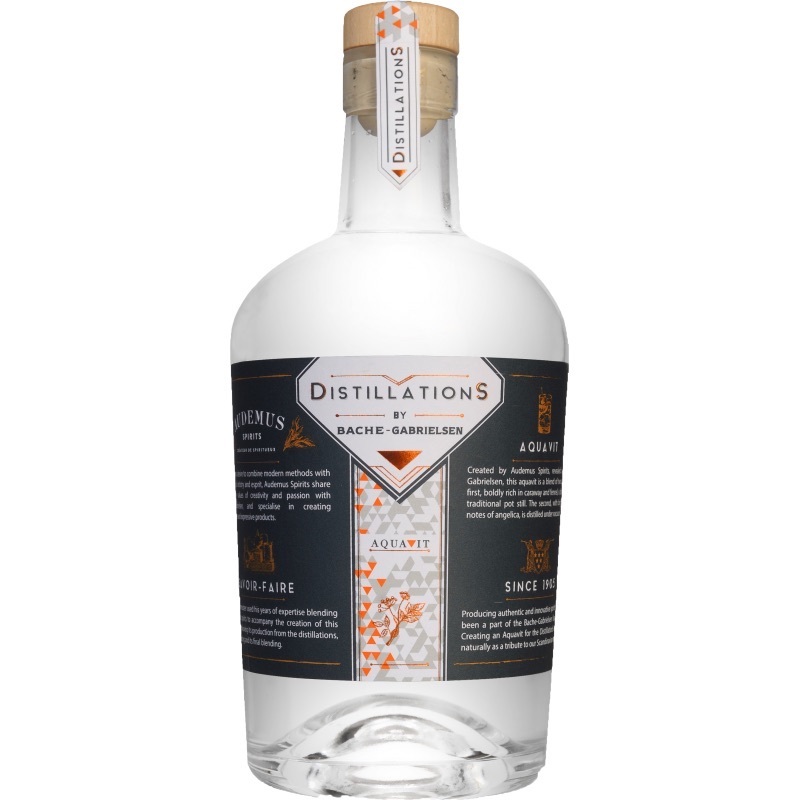 And now they’ve released the second in this ground-breaking DistillationS range, and it’s one that our Scandinavian readers will be familiar with, an Aquavit. However, if you hail from elsewhere around the globe, the spirit might be something you might not have heard of. 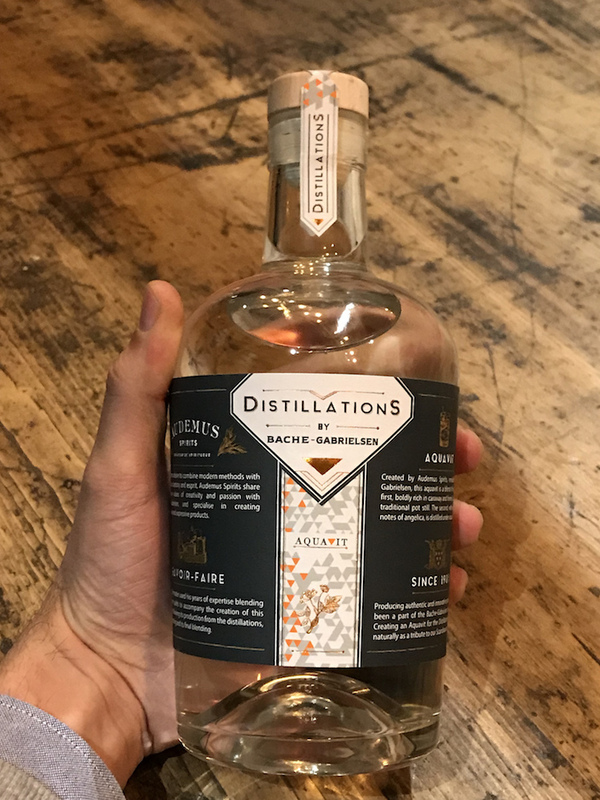 The clear spirit comes to market thanks to a unique collaboration between the house of Bache Gabrielsen and the micro distillery, Audemus Spirits, in Cognac. Of course, being as Bache Gabrielsen has their roots in the chilly climes of Scandinavia, it makes perfect sense for them to bring us such a delight. 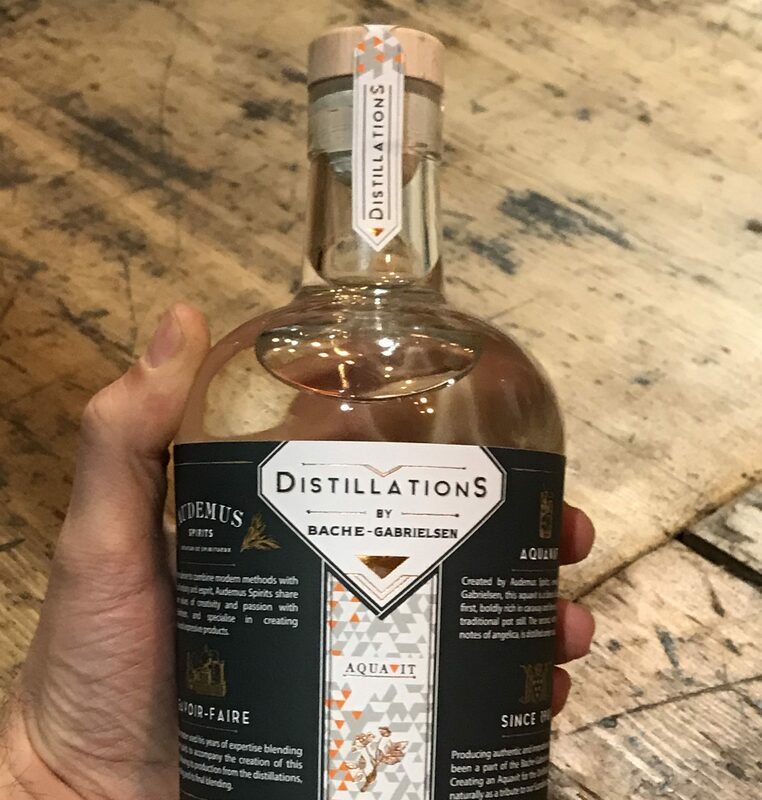 Both Jean-Philippe Bergier of Bache Gabrielsen and Miko Abouaf from Audemus Spirits have combined their unique talents to bring DistillationS by Bache Gabrielsen Aquavit to market. Max was able to have an in-depth discussion with Miko from Audemus, Jean-Philippe and Hervé from Bache Gabrielsen to get the lowdown on everything to do with this new spirit offering. And Max being Max, he asked those burning questions that we knew our global audience would be keen to discover the answers to. Max, Cognac Expert: So I heard about the Aquavit. I don’t even know when I tasted Aquavit the last time, it’s been a while. Can you tell me how this collaboration came about? Miko, Audemus: Well, the first thing is that Bache Gabrielsen are innovating a lot in Cognac, and especially being innovative in the way they present spirits. In terms of the houses that are here, they’re breaking the rules—within reason, obviously—but really pushing the limits, which is something I really like and respect. So whilst they have their classic ways of doing things, they can also say that there are ways of innovating. So we started talking quite a few years ago, just as colleagues, and the idea came out of a discussion. The notion of a collaboration had floated about for quite some time, but it was after a visit to Denmark, when I tasted a flight of different Aquavits. I’ve always loved Aquvit, but it didn’t necessarily make sense for us to produce these on our own. But doing so with Bache Gabrielsen gave us the market and gives us legitimacy to be able to do it, with the Norwegian heritage and the Scandinavian market we can. So I came back home and carried out a first test. I have a big cabinet of spices and I pulled out all the different things that I thought would be interesting to put in the Aquavit. We tasted it a few days later after it had rested a bit, and we really enjoyed it—it was something that stood out. And after tasting the first sample we agreed that it was a good thing to do. Hervé, Bache Gabrielsen: Well, Miko is an interesting guy with a really fresh approach to distillation. 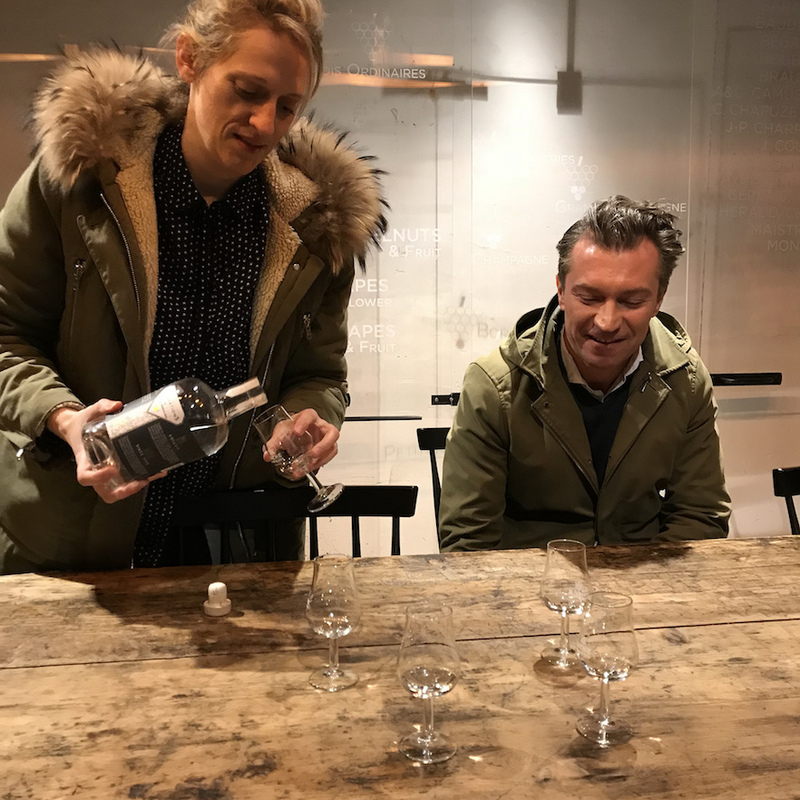 We’ve already tasted the gin from Audemus, Pink Pepper, that’s really nice, and we really like the idea of sharing the different expertise of our two companies. Max, Cognac Expert. It’s very rare that two companies in Cognac collaborate in such a way. We think it’s really cool that you’ve done this. Hervé, Bache Gabrielsen: Yes, it is. But you know that in the fashion industry and the music industry are collaborating a lot, and it’s great to bring this to the Cognac industry. Max, Cognac Expert: So, I’m completely ignorant about Aquavit. But it’s distilled from grain or potatoes, and that sounds pretty much like Vodka to me. So what’s the difference between the two? Miko, Audemus: So, the idea of Vodka is to have a neutral spirit. It’s the expression of the base product that you’re using; this could be wheat, corn, potatoes, or whatever. But you don’t necessarily add anything in to flavor it. It should be as neutral as possible. Aquavit, however, is closer to a gin. We start off with a neutral spirit that is pretty much Vodka—in our case it’s a wheat spirit—and then re-distil it to flavor it. So an Aquavit is pretty much a flavored Vodka, if you like, in a certain sense. And it contains caraway and/or dill seeds, which is what gives the flavor. So similar to gin, which is Vodka flavored with juniper berries. Whereas the Scandinavian equivalent is Aquavit. Jean-Philippe, Bache Gabrielsen: Yes, it’s much closer to a Gin than Vodka. But the taste is different, with the caraway and anise. Aquavit has its own unique style. It starts with a full body with a rich charisma, and then the anise comes in lightly and then the angelica makes it a light and floral style. And then the orange gives that elegance. The fennel comes through on both the nose and the palate. We kept the anise very light, so it doesn’t kill all the other flavors. This particular blend keeps the freshness and the character from each of the ingredients. Max, Cognac Expert: So you distilled this twice? Jean-Philippe, Bache Gabrielsen: Yes, once in the Charantais pot still, and then just once in the vacuum. Max, Cognac Expert: So you consume this product chilled, right? Miko, Audemus: Well, not necessarily. The idea with Bache Gabrielsen is to create something modern and something different. You can obviously drink the Aquavit in a very classic way when you have it in the freezer and you pull it out when you’re serving a Smorgasbord, smoked salmon, or whatever it is that you’re eating. But you can equally drink it in cocktails. We’ve worked with a few bartenders, particularly one Norwegian lady who lives in London, called Monica Berg, who’s made a cocktail as a signature serve for us. You can also drink it with tonic, or in a Martini, which is my preference, as Martini’s are my favorite drink—it works beautifully in a dry Martini. Jean-Philippe, Bache Gabrielsen: Whenever I taste a product I always taste at a minimum of 10 degrees, to be sure of what they’re really like inside. Because low temperatures kill the flavors, so its much more interesting to warm it and discover what it’s really like. And this Aquavit is more on the fruity side. Is Scandinavia the only region of the world where Aquavit is drunk? Max, Cognac Expert: So it seems Norway is the number one market for Aquavit worldwide, also very popular in Sweden, and Iceland. Interestingly Peru and Germany are important markets, and of course, Denmark. So this Aquavit is made for Norway, but it could also travel, right? I’m a big fan of taking old school spirits and putting them in a new concept. I think people are looking for this kind of stuff. Miko, Audemus: Yes, we had a group of bartenders come just when there was news of the Aquavit being released, and to think that there’s a new offering on the market, something that has a very different angle is great. Yes, we do think that Norway is going to one of the main markets, but there’s no reason why it can’t be used in other places. For example, in London there’s a restaurant called Aquavit, and we’ve worked with the head bartender there a number of times. There’s definitely room for it to go on the cocktail menu. As people see it, as they try it, and realize it’s not something that’s going to burn their heads off, and that you don’t necessarily have to drink it in a classic way. You can drink it as a gin and tonic or whatever, and I think people will open up to it, which is the aim. Hervé, Bache Gabrielsen: Yes, our idea is to intregrate this Scandinavian drink with French savoire-faire, creating a cross-over product using the expertise of both companies. Bache Gabrielsen is very keen to work with different producers, and especially smaller distilleries. We’re using our Scandinavian heritage to work with different product producers from Norway, and to bring some really innovative product to market. And yes, it’s a very popular drink in Germany, although I didn’t know about Peru. Max, Cognac Expert: Yes, my Grandmother always loved Aquavit, and always had it in the house. I’ve never seen Aquavit in a bar today, but I understand that’s a direction that you want to try with this product. Hervé, Bache Gabrielsen: That’s right. Max, Cognac Expert: So my next question is how is it made? What goes into creating Aquavit? Miko, Audemus: It’s actually the blending of two spirits. We use a classic Cognac still, a small 12 hectoliter still to make the core of the spirit. This is where we have caraway, coriander, green anise, fennel, and one of the key ingredients is orange blossom. which went into becoming the body of the spirit. And then the second distillation happened here, within my distillery, where we use the reduced pressure distillation. This means that when you distill under vacuum you lower the temperature at which the alcohol will boil, so you’re not cooking the botanicals, it’s all at low temperature so there’s very fresh flavors that come through. The key botanical that really brings out the essence is Angelica. Then we blend the two together and leave them to rest for up to several months, filtered lightly, and then bottled. Jean-Philippe, Bache Gabrielsen: So Miko knows a lot about the spirit, so we discussed in depth about the style. The idea was to make a very smooth and fresh Aquavit, with not too much anise taste. We wanted to add something new in the taste of Aquavit. There’s a lot of caraway, and to lighten up the taste there’s orange flavor and angelica for a sweet freshness. 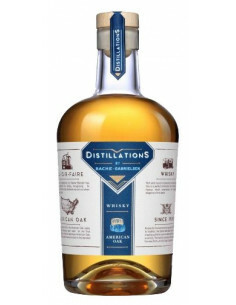 The goal was to make a mix of the two distillation processes, one of the classic Charantais pot still which makes for the round smoothness because of the time it takes to distill the product. And then the second step of the vacuum keeps the freshness of the raw materials. Max, Cognac Expert: Yes, I don’t know so much about this vacuum technique. But I hear from certain ‘hipster’ distillers that this technique is really taking off. Jean-Philippe, Bache Gabrielsen: Yes, and it really makes sense here, to keep the fresh flavors of the product, such as the Angelique. It’s not necessary to vacuum distill all of it, just certain parts. Max, Cognac Expert: So, have you thought about aging it? Miko, Audemus: (Laughs). Well, yes we have. So watch this space, that’s all I can say. Hervé, Bache Gabrielsen: Well, some months, but it will depend on Jean-Philippe and the expectations about the aging. So there you have it, a brand new spirit offering from the wonders of Bache Gabrielsen. 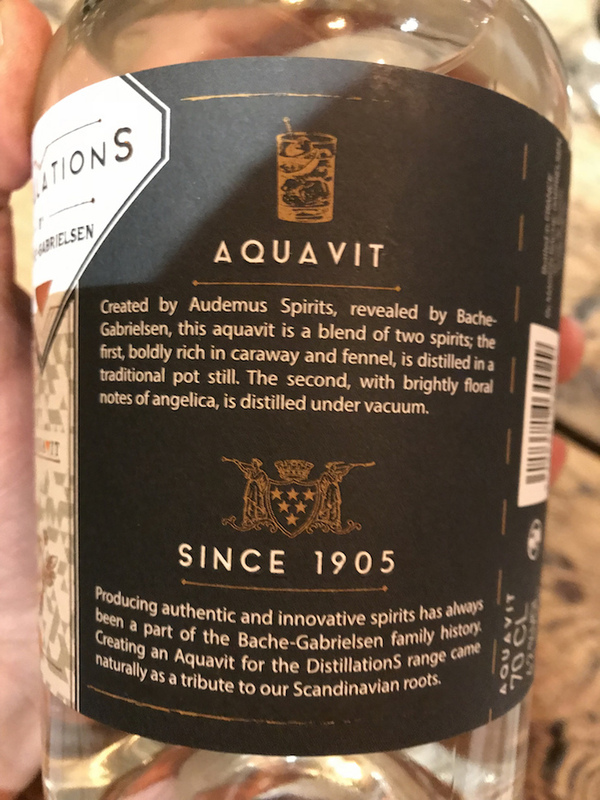 Find out more about Aquavit in our online shop, and of course, delve further into the many other wonders that the house of Bache Gabrielsen has on offer.